Skin sagging is inevitable – it will happen to every single one of us if we live long enough. There are contributing factors beyond our control, such as age, genetics, and ethnicity. Then, there are some lifestyle choices we can make to help the cause. The aging process affects the entire facial structure. Over the years, our skin thins. There is a decrease in collagen and elastin. Facial bones, the scaffolding that holds up our faces, begin to degenerate. The combination leaves us vulnerable to the downward pull of gravity. Genetics and ethnicity play a large role in how we age. People of color typically exhibit less severe skin laxity with signs appearing a decade later than lighter skin types. 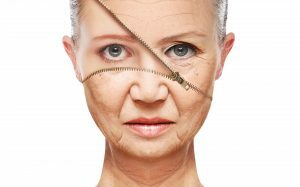 Lifestyle factors that can accelerate the aging process include excess sun exposure, smoking cigarettes, air pollution, rapid weight changes, and high sugar diets. Sagging cannot be prevented, but it can be delayed and improved. A lot can be achieved with wise choices that include a healthy, balanced diet, exercise, use of sunscreen, avoiding cigarettes, and minimizing exposure to pollution when possible. The rest can be achieved by the right dermatologic care. People who want to delay skin laxity should consider incorporating a topical Vitamin A derivative (retinol). Retinols have been shown to increase skin turn over, boost collagen production, decrease wrinkle formation and improve skin texture over time. Since retinols have the potential to cause dryness and irritation, it is best to consult a dermatologist to help choose the best one for your skin and give you specific instructions on proper use. Fortunately, various minimally invasive cosmetic procedures can target the specific factors that contribute to skin sagging. Dermal filler injections can be utilized to replace volume lost by thinning of bone. Titan, an infrared device, delivers heat energy below the skin to cause contracture of tissue and stimulation of collagen building. It is most helpful for tightening the skin of the lower face, jowls and neck region. For laxity in the eyelid region, microneedling with PRP (Platelet Rich Plasma) or with radiofrequency are most effective. Life style modifications, retinols and cosmetic treatments are key to delaying and minimizing skin sagging. In some cases, however, surgical procedures are necessary to achieve the desired improvement.